This is a very popular synth designed by John Simonton in 1972. The 2700 series was the first complete synth to be more or less self contained e.g. Power Supply, analog synth modules, and keyboard controller all in one package. Simonton developed the modular approach and began marketing Do-It-Yourself synthesizer kits in the late 60's. I purchased this kit in 1974 as one of my first forays into electronic music. It is strictly monophonic and is programmed using patch cords and audio cables to create a single patch. There are a number of controls to vary Attack, Decay, bias into filters, etc., but essentially after programming, you will be recording one patch at a time. At the time this was not a limitation, because this synth is pre-computer age and most recording was via tape. It is a piece of history now, although it can be easily incorporated into a studio for nifty recording of bass lines or some wild electronic sounds. I haven't used it for years, but got it out just recently to record some of the sounds for posterity (now that recording is a piece of cake using computers). 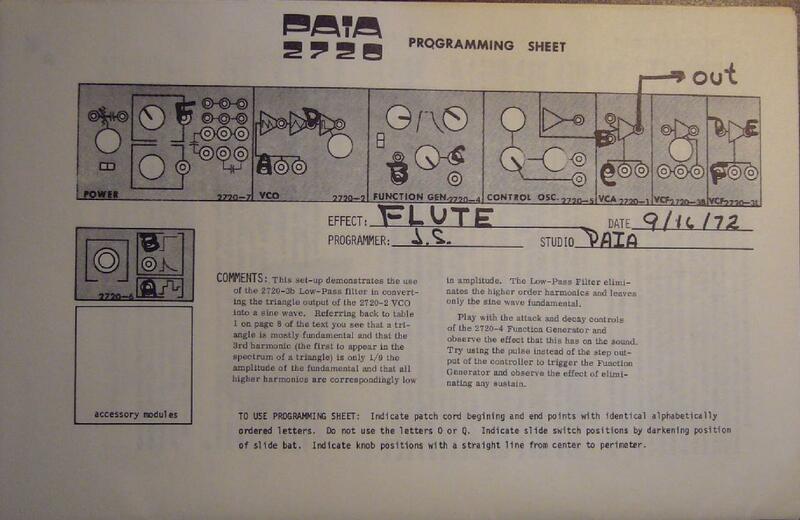 Here is an example of the Paia 2720 Modular Synth setup for a bass line. The samples were sequenced in a modern DAW, using a typical software sample player. Paia Bass Example. 1. On the keyboard, the lowest 'B' key sticks a little. 2. The rubber foot in the front right corner is toast. copyright 2007 - Design Systems, Inc.